Got myself a day-off to settle some stuff at the bank. This is what I spent on my meal for the day. My friend took me to this shop some years ago. I happened to be nearby and decided to make my 2nd visit to this restaurant. They have very much refurbished the interior. Now it's fully air-conditioned and they got a 2nd floor! What surprises me is they are taking orders with PDAs!!! A little overkilled for a restaurant like this but it's a good try nevertheless. The steamed chicken still tastes pretty good. I added some spare-parts (Gizzards to be specific) and a bowl of meatballs. The portion of the chicken is just nice -- considering it's a serving for one. You'll usually get much smaller portion elsewhere. This restaurant is owned by the the Oversea (No typo here. It's the name of the restaurant.) and serves a variety of Hong Kong style dishes. I must recommend this as I've tried several dishes on different occasion and they were all splendid! In fact it's recommended by someone I know too. Worth giving it a try, if you haven't heard of it. They have a special after-9 discounted menu for the late eaters. Popular drinks such as the Milk Tea, Yin Yong (aka Cham), Coffee ala Hong Kong etc are all at just RM2 after 6. Pretty worth it for the budget-conscious. 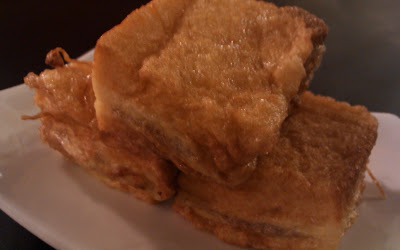 I'd rather call it the 'Bite-Size Toast', based on its Chinese name. It's 3 pieces of toast quarter of the size of a common French Toast. Each toast is supposed to have a different stuffing -- tuna, kaya and butter, chicken and ham, as claimed by the captain. My taste buds told me I have had 2 kaya and butter toasts and one tuna toast. 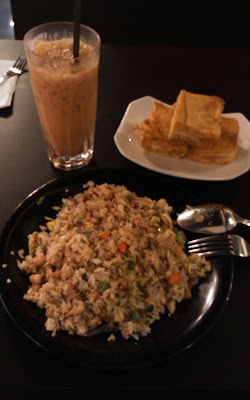 The fried rice may look a little too little, it's actually just nice and yummy! All in all I'm pretty satisfied with the servings and the price. There are still other items in the the after-9 menu which I'd give them a try on my next visit.